"The fruits of your corruption have come to take their due." Tommy is bi-racial: half Korean and half African-American, with striking facial features. His sculpted profile gives him model-like looks, but his features are rounded enough to make him inviting rather than intimidating, although his physicality and green eyes are arresting. He is always impeccably dressed when not wearing dressed as his alter ego. 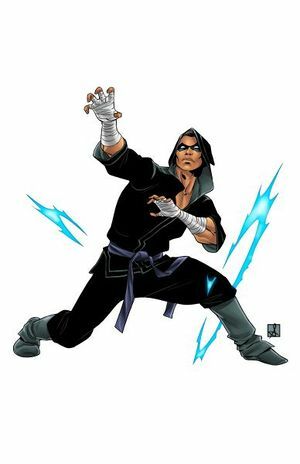 When going out as Black Steel, he wears a black gi paired with a deep hood and a domino mask. Tommy is a modern day sophist, and he loves rhetoric, philosophy, and debate. His nature is to be quite laid back and zen-like under most circumstances. However, when the weight of his family's misdeeds lay upon him, he is driven to make recompense, and all grace leaves his tongue. He becomes pragmatic and stoic, enabling him to make the hard choices that give his life meaning. If there is no place for him in the light, he will embrace the darkness to remove those that justice cannot reach. Serenity: The character seeks freedom from the mistakes or tragedies of their past. Outsider: Tommy is a loner, accepted neither by the law nor by the criminal underworld on which he preys. Tommy's mother was a US Diplomat stationed in South Korea, and his father was... complicated. The assassin Shindo infiltrated the party only to get a lay of the land and information, not for a liason with a diplomat. But that interlude resulted in a son. His mother, ever pragmatic, did not tell Tommy who his father was. One of his enemies did, after killing her. It was then that Tommy's powers manifested, enabling him to escape. From then on, he lived life on the run, with one goal other than survival -- not to end up like his father. But his powers were more fit to follow his sire than rebel against him -- tailor made for an assassin. Heroes didn't accept him, and villains... well, his father had made enemies on both sides of the law. So Tommy found another use for his abilities: to bring to justice those villains that the system couldn't touch, and do what the other heroes couldn't... or wouldn't. With his strength, speed, and skills, Tommy would be a deadly foe even without his powers. His ability to teleport, control kinetic energy, and “mark” targets makes him an implacable hunter, able to reach targets where they think they are safest. Tommy's “Assassin's Mark” is a quasi-psychic “tag” that he can place on a single person or object by touching them, and then find later (with a successful Perception roll). His Assassin's Mark does not last forever, of course: it fades over the course of a few days. Tommy's usual tactics are to gather his own evidence to come to a judgment on the target, scout them out and discover their weaknesses, use his connections to get close enough to “mark” them, and then kill them when they least expect it. This page was last modified on 5 December 2014, at 09:02.